"Somewhere in Time" 1980 film with parallels to BBM? Re: "Somewhere in Time" 1980 film with parallels to BBM? Happy 100th Anniversary to Elise and Richard! June 27th is this Wednesday. I invite you to commemorate this milestone by watching the movie, and making it a special day for you, and those you love. Somewhere in Time is about True Love, and the Forever Aspect of Love. Make it a day to let your loved ones know you love them. If you need Somewhere in Time Collectibles to help you do that, visit the Somewhere in Time Website online shop. Also of importance -- Grand Hotel will celebrate its 125th Anniversary this July 10th, and the hotel is celebrating from July 10 to 15th. They will be cutting a 125-foot long cake, serving it to guests on Tuesday, July 10th. Somewhere in Time is more than a movie -- it's a celebration of Love. Thank you for being fans of this most extraordinary piece of classic entertainment. I think I might watch the film tonight and toast to Elise and Richard. Sounds like a great idea...thanks for these wonderfully romantic photos! I've wanted to visit Mackinac Island ever since I saw the movie for the first time. Congratulations to Elise and Richard! Funny, someone on Facebook posted that today was the day that Marty McFly and the Professor projected to arrive in the future in "Back to the Future." Someone debunked it, though. Looks like it's still a significant date after all. Wow, that hotel is really something! It's the perfect setting for the movie. I'd love to see it one day. I'm so glad this thread was revived this week -- Somewhere In Time is one of my all-time favorite romantic films but I haven't watched it in years. Time to put it on my Netflix queue; we only have it in VHS. 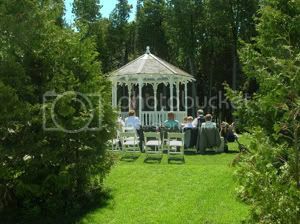 "The Somewhere in Time Gazebo is situated on a wooded bluff just east of Fort Mackinac, overlooking the lilacs of Marquette Park, the village of Mackinac Island, and Straits of Mackinac. 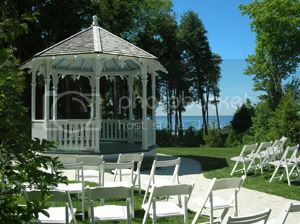 This is the original gazebo from the 1980 romantic movie Somewhere in Time, filmed on Mackinac Island. "Somewhere in Time, the romantic period drama starring Jane Seymour and Christopher Reeve, was filmed on Mackinac Island in 1979 and released in 1980. The film was met with limited interest when first released, but over time has developed a broad following of fans and is now considered a cult classic. Members of INSITE (the Somewhere in Time fan club) gather for an annual weekend celebration at Grand Hotel on Mackinac Island in October. A monument ("Is it you?") marks the spot where Christopher Reeve's character finds Seymour on the west side of the island. "The gazebo constructed for and used in scenes in the movie remained on the island after filming. It was placed in the back yard of the Michigan Governor's Summer Residence until the fall of 2005. The gazebo has been restored and moved to a new location on a wooded bluff near Fort Mackinac." We only have it in VHS. It's one of those films that, as much as I like it, I never seem to get around to obtaining it on DVD. "Procrastination, thy name is Wrangler." Today is September 25, and would have been Christopher Reeve's 60th Birthday. We encourage you to reflect on the man whom we all love and respect for his generosity, positivity, vision. And for the inspiration he still provides us -- for strength and courage in the face of adversity -- every day. Back on August 26th, the Ovation Channel showed "Somewhere in Time." They will be showing it again 2 times today in honor of Chris. The Ovation Channel is doing something beyond just presenting the film. In the commercial breaks, they are revealing facts about Chris' life, for example, "At 6 feet 4 inches, he was the tallest actor ever to play Superman." Also, "With his blue eyes, he was also quite blue-blooded. Chris was not only a descendant of a Mayflower Pilgrim but also a descendant of King Henry V of England." The Ovation website says they will be showing SIT again at 7:00 PM and 9:30 PM Central Time this evening. For INSITE Members: 2nd Quarter INSITE issue is filled with goodies, including our gorgeous color commemorative for 2012, and is going out to the membership tomorrow! If you're not a member, please subscribe -- it's easy to do so in the Fan Club section of the SIT Website. You'll be delighted with our elegant magazine--and you'll definitely want to frame the 8 by 10 Commemorative. Also, we will have a very exciting announcement regarding the Somewhere in Time stage Musical very soon!